Jennifer Griffin, daughter of first Vice-Chancellor Dr Alan Burges and his wife Evelyn, recently visited the Coleraine campus with her cousin Elizabeth Farley from New South Wales, Australia. Familiar yet changed! Well the entrance had moved, the barriers new and taking a ticket to enter an area which I first knew as verdant pasture somewhat surreal. 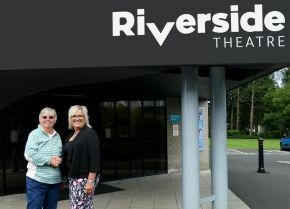 Thank goodness the meeting place was The Riverside and the Theatre my mother had worked so hard to establish still overlooked the Bann, a solid reminder, evoking memories of its early existence – in Evelyn’s dreams. “I remember the first fundraiser held at Knocktarna. A Christmas coffee morning with dried flower arrangements, table centres, cakes and the inevitable guess the weight of the Christmas cake. Evelyn had even grown the flowers and dried them in readiness. Helpers counted the takings £99.10 shillings. Emptying our purses we willed the total to rise above the magic £100. It did and the first of many steps was taken to provide what every University needs – a Theatre. What a joy to witness it’s recent refurbishment and meet with staff and members of the Theatre Club, which has been so crucial to the development of drama on the campus. “The Diamond, now without it’s raised surround, but with it’s wonderful wooden floor, echoed with memories of Graduation Ceremonies and my father’s farewell dinner. From the early days to the present. What a fantastic asset is the new Lecture Theatre which fits seamlessly into the previous building, just brilliant. “If my mother’s dream was of a Theatre, my father’s was of a campus which not only served academia but was ecologically sound and easy on the soul. Trees were in the earliest plans, along with sporting facilities and halls of residence. Buildings and pitches are relatively quick to produce, but a tree needs nurture and time. The saplings planted in the late sixties have matured across the campus and their impact was immediate and immense. Beautiful mature trees which were so hard to imagine fifty years ago. “Standing at the beginning of the timeline beside my father’s name, memories flowed across the years. Living in a caravan whilst Knocktarna was rebuilt; the first university office in Coleraine Girls school; moving to Fortview before finally a real office in Phase One; unveiling the gatepost and foundation stone; and degree ceremonies at which each of my parents was awarded an honorary degree. “There is much of my family’s history bound up with the University and it was really memorable to visit in this year celebrating the 50th anniversary of the first undergraduate intake. Thank you to all those who contributed to such a special day it was much appreciated by both my cousin Elizabeth and myself.